"Windy City DJ's voted Best Of Weddings Pick by the Knot Wedding Magazine"
"I am a very picky person that want things just right - you spend a lot of money at a wedding and you want it to be perfect, and our Windy City DJ was just that - Perfect!!" "Our DJ was awesome! I was one of those annoying worried brides - and it was all for nothing. The DJ was wonderful - very down to earth and he made it better than expected! I will recommend Windy City DJ's to all my friends and family!" 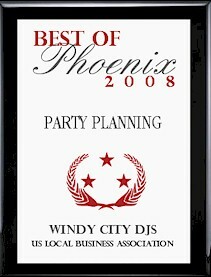 Windy City DJ's is proud to announce their 30th Anniversary as one of the most trusted & reputable Phoenix DJ Company's in Arizona. Windy City DJ's have performed all over the valley, so if you are searching for Scottsdale DJs, Glendale DJs, Chandler DJs, Mesa DJs, Gilbert DJs, Tempe DJs, Casa Grande DJs, or DJs any where else in Arizona, we would love to make your party the best! During the past three decades, we have reached some incredible milestones. For example, more than 10,000 brides have chosen us to be their MC and Wedding DJ for their special day. 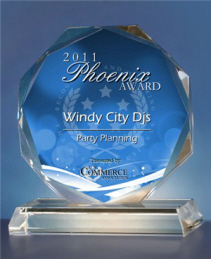 More than 1000 businesses have chosen Windy City as their Arizona DJ Company for their corporate events. Windy City DJ's are great with kids too! Hundreds of schools have hired us as their Phoenix DJ for school dances and trust us to play clean current music. Our Arizona DJs have performed at countless birthday parties, graduation parties, and anniversary parties. We are family owned & operated and have spent years perfecting our craft so that we may provide only the finest Arizona DJs. Windy City DJs can provide you with an experienced Arizona Disc Jockey who always conduct themselves in the most professional and tasteful manner. The largest corporations in the world, including GE, Wells Fargo, Waste Management, Orbital Science, America West, and hundreds of others all trust Windy City to perform at their special events. Our Phoenix DJs have satisfied over 11,000 clients in the past 25 years, making us the most recommended Arizona DJ Company. So whether you are looking for an Arizona wedding DJ or a Phoenix DJ for your birthday party, karaoke party, or corporate event, Windy City DJs wants to be your Arizona Disc Jockey & Music Entertainment source. After 30 years of service, we have the proven experience and talent to know how to keep a party energized and flowing smoothly. TALENTED - We realize that most DJ's in Arizona have great music, but the real talent lies in knowing when to play the best songs & in what order to play them. Playing GREAT DJ MUSIC ... it's what we do! EXPERIENCED - Our Arizona DJ's are experienced, passionate, professional and the best at getting even the toughest crowds up and dancing. PROFESSIONAL - Our Phoenix DJ's know how to interact with your guests without being over-the-top, or stealing the show. We always maintain our professionalism, which means we dress in a tuxedo and talk on the mic only when necessary. RECOMMENDED - Over 100 resorts recognize Windy City as the premier Wedding DJ Company in Arizona. Our Phoenix DJ's are recommended by the Wright House, Wrigley Mansion, Embassy Suites, Tempe Mission Palms, Crown Plaza, Pointe Resorts, Gainey Ranch, McCormick Ranch, Mountain Preserve, Aunt Chilada's, La Posada, Orange Tree Resort, Ocotillo, Grayhawk, Sun Ridge Canyon, Foothills, Club West...and just about every other resort, golf course, and reception hall in Phoenix. We are the MOST RECOMMENDED Disc Jockey Company in Arizona. DEPENDABLE - Not only has Windy City DJ's been a reliable disc jockey service in Arizona for over 25 years, but we also plan for the unexpected. A back-up Windy City DJ with full sound system is on call 24-hours a day. HIGH STANDARDS - We set the bar for Professional Disc Jockey service in Arizona. We are not happy unless your friends or co-workers tell you, "That was the best party we have ever been to". AVAILABLE - A Disc Jockey can make or break a party. We keep you informed and keep ourselves available to listen to you. When it comes to choosing an Arizona DJ service, we hope you will choose THE BEST and hope you will allow us to show you that WE ARE THE BEST DISC JOCKEYS IN ARIZONA. Call us any time at 480-966-9900 for more information, or to reserve a Professional Windy City Disc Jockey. Awautukee, Casa Grande, Apache Junction and many other other Arizona towns and cities.